The White House is under pressure from Democrats and Latino leaders to ease deportations, as the number of unauthorized immigrants sent home neared two million under the Obama administration. Last week, National Council of La Raza President Janet Murguía called the president the “deporter in chief.” Over the weekend, hundreds of detainees at a federal immigration detention center in Tacoma, Wash., called for an end to deportations with a hunger strike. The American public is evenly divided on whether the increased number of deportations of undocumented immigrants in recent years is a good thing or a bad thing (45% each), according to a recent Pew Research Center survey of U.S. adults. About half of whites (49%) view the growing number of deportations positively. But Hispanics have a different view. By 60% to 35%, Hispanics view the increase negatively, according to the survey. The pressure on the president comes with an immigration reform bill stalled in the House. 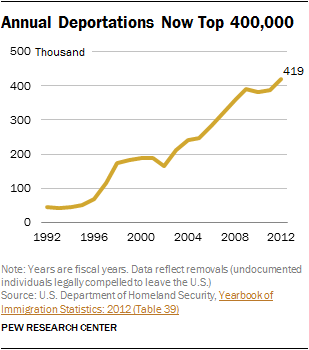 Meanwhile, deportations have risen sharply under Obama. About 395,500 immigrants per year have been deported since 2009, compared to about 250,000 deportations per year under George W. Bush. In our survey, opinions split along party lines. About as many Republicans (55%) called the increased deportations a “good thing” as Democrats (53%) called the trend a “bad thing.” However, a majority of Republicans (64%) and Democrats (81%) support allowing unauthorized immigrants to legally stay in the U.S. if they meet certain requirements. Hispanics last fall expressed concern over the threat of deportation in a Pew Research survey. A majority (55%) said it was more important for undocumented immigrants to be able to work and live in the U.S. without the threat of deportation than to obtain citizenship. About three-quarters of the nation’s 11.7 million undocumented immigrants are Hispanic, according to Pew Research estimates.